Hair transplantation, which has gone through a major transformation over the years, was first introduced in the early 1800s. By the 1950s, Dr. Norman Orentreich introduced the new theory of donor dominance to the field of hair transplantation. He is thus considered to be the father of hair transplant. Over the years, more and more advanced and sophisticated methods have been introduced and tested. Today’s Mega sessions of hair transplant using high-powered microscopes allow thousands of Follicular hair units to be placed in one session, transforming hair restoration into an art. Furthermore, with new harvesting techniques such as Follicular Unit Strip Transplant (FUT), Follicular Unit Excision(FUE), Body Hair Transplant (BHT) and the new, more advanced closure technique Trichophytic Closure, patients are assured of less visible scarring in the donor area. This is another option for donor excision. With this method we can extract follicular units from 1 to 3 hairs individually without any linear incision. Very small circular punches are used to extract the follicular units, which are then moved to the recipient area. FUE is more of a minimally invasive procedure than the linear harvesting technique. There is minimal discomfort in the donor area and no sutures are needed to close the donor. There is no linear scar formation, and there is less recovery time for healing. This technique has become very popular amongst clients who prefer to keep their hair very short. However, there are many disadvantages to using this technique. 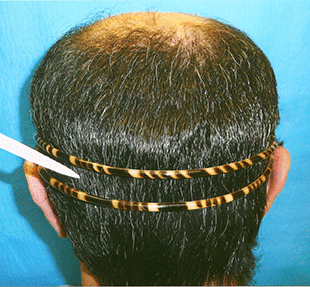 Due to blind site incisions made in the donor area, there may be collateral damage to the existing donor hair. This could cause damage to the donor site and also the hair follicles being extracted, thereby resulting in poor growth and limiting the donor hair available for future use. Since hair loss is progressive, if a client is young and will continue to lose hair, is a patient with curly hair, a patient with more advanced hair loss or a patient with limited donor hair, this technique is not recommended. Other disadvantages for this technique include longer time for donor harvesting, higher expense, donor area shaving, multiple white spots in the donor area after surgery, and exposed donor area immediately following the surgery. At the time of your consultation, Dr. Meshkin will examine and test the donor area to see if you are a good candidate for the Follicular Unit Excision procedure. Strip harvesting is the most common and most efficient technique used to remove the hair follicles from the donor site. A single or double bladed scalpel is used to remove a strip of hair bearing tissue in the donor zone. The incision should be made very carefully to assure that the follicles are removed intact. Following removal of the strip, Dr. Meshkin closes the wound using the most advanced technique. Dr. Meshkin’s new closure technique makes the scar line virtually invisible after healing. Removal of the donor hair and closure of the wound while hair follicles are visible, allows for the least damage to existing hair – resulting in saving the donor hair for future use and, more importantly, maximum hair growth. For clients who are young, have limited donor hair, curly hair or very densely packed hair, this method is the most efficient. The Trichophytic closure of the wound is the most advanced closure technique that will yield the best result. It is used to close the wound while performing the strip method. Strip harvesting is the most common technique used to remove the hair follicles from the donor site. A single or double bladed scalpel is used to remove a strip of hair bearing tissue. The incision should be made very carefully to assure that the follicles are removed intact. Following removal of the donor strip, the upper or lower edges of the wound is trimmed approximately 1mm, then double layered suturing is used to close the wound. While suturing the last layer, the hair is allowed to come through the line. This technique is called Trichophytic closure, which allows for the most yield of donor hair and also makes the scar line virtually invisible after healing. While it is the best method, it requires more surgical skill and attention to be performed properly. If a clinic is not set up for more advanced surgical procedure, this technique is usually not offered or performed. Hair restoration is going through very important evolution for improving both the naturalness and fullness that can be achieved from only one to two surgical procedures. Today’s new advanced Ultra Refined Follicular Unit hair transplant allows thousands of hair follicles to be placed in one to two sessions with the lateral Microslit grafting technique. 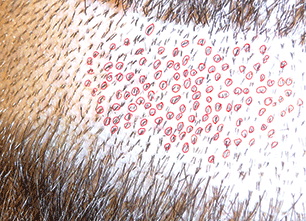 This technique requires high-powered microscopes to divide the donor strip into its natural follicular unit. The microscopes are used to dissect and remove excess tissue attached to the hair follicles, therefore eliminating the skin gaps or dead space. Also by using very unique, small and customized needles for each individual client, Dr. Meshkin is able to make the recipient sites in very close proximity to each other in its natural orientation. This unique technique requires more skill and attention to be performed properly. These very small and minimally invasive incisions enable the surgeon to dense pack the frontal hairline and the crown area, and give the utmost cosmetic results. There are many different sources for body hair, from the nape of the neck down to the top of the toes. These also represent many different types of hair. The variations are characteristic of the source. The source may include finer hair, straighter hair, curlier hair, coarser hair, shorter hairs, and potentially longer hairs. The wide variety alone make body hair far different than scalp hair. Body hair can be separated into two categories: beard hair and the rest of the body. Beard hair is rarely in the telogen (resting) phase whereas other parts of the body may exhibit up to 60% of the hairs in the telogen phase. Beard hairs usually grow as single hair units, but on rare occasions a three hair group may be noted. Only those with a thick beard will have multiple two hair groups. Beard hairs tend to grow at a much more rapid rate and for a longer duration than other forms of body hair. This is why individuals are often able to grow beards that are quite long. Beard hair transplants are far more consistent and will produce a yield typically between 60% and 100%. Other forms of body hair are usually shorter in length and grow at a slower rate than scalp hair, typically not much longer than 3 to 6 cm in length. The hairs are often curly, but not nearly as curly as most beard hairs. Some forms of body hair grow even shorter such as the hair on your arms, the hair on the tops of the toes and eyebrows. These body hairs are often finer in appearance, though sometimes they are just as coarse as head hair. Even when the source of body hair is coarse, the hair will not grow as coarse on top of the head. The hair may produce a cosmetically insignificant result as compared to head hair and beard hair. by follicular units either by using the FUE or FUT technique. Follicles are transplanted to the eyebrow area via the method best suited to the needs of the patient.Eyebrow restoration proceduresare usually performed in an outpatient setting. Postoperative complications are usually limited to minor pain and swelling. The purpose of transplantation of hair to the eyebrow is to recreate the eyebrow in a natural contour. Dr. Meshkin works with each patient to outline the eyebrow area to conform to the natural symmetry of the patient’s face. Depending on the size of the area to be transplanted, more than one transplant session may be required; two or more sessions several months apart are common. Donor hair for the transplant is taken from a site that furnishes finer rather than coarser hair; finer hair is a better "match" for eyebrow hair. Donor hair is transplanted as units of one to two hairs. Each graft is placed into an incision prepared for it. The use of single hair grafts permits meticulous adherence to the eyebrow contour for a natural appearance. As the transplanted hairs grow in their new position they may require occasional trimming as well as "training" with gel or wax. Transplantation is the only procedure used to restore beard hair. Beard surgery is a very specialized procedure. As is the case for eyebrows and eyelash, donor hair for transplantation is taken from the dense area in the donor zone in the back of the head. All grafts are single hairs meticulously placed into the beard and mustache. The direction and the orientation of the implanted hairs follow patient's own hair for the most natural result.